Fanatic SUP Stylemaster Bamboo Edition 10'6"
As a classic nose-rider, this board is more influenced by Longboard surfing than any other board in the Fanatic range. Easy to paddle, its super advanced surfing potential allows the deepest carves with a smooth flow, whilst you style up and down the wave with your toes hanging loose. The wide nose leaves plenty of room for creative riding and adds incredible wave catching potential. Available in the beautiful and supreme Bamboo Sandwich technology in the sporty length of 9’0”, the classic 10’0” and the all-new floaty 10’6”. 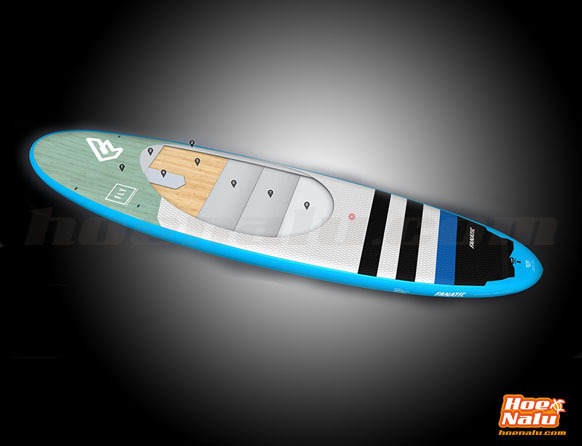 If you like this board, take a look to the Fanatic Carbon 50 paddle with the amazing bamboo construction, light and flexible paddle. How to choose the Fanatic Stylemaster board that best suits your needs? The Fanatic Stylemaster range has three different sizes. Choose the one you like most. BS Bamboo Sandwich technology is a lightweight bamboo wood / glass composite construction with great strength and unique optics. Combined with some extra glass reinforcements, it absorbs high impact forces. Overall a very durable layup with unique wooden deck optics and great weight / price ratio.